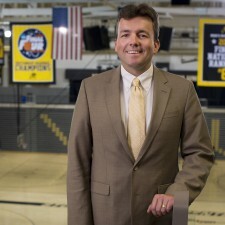 This month, we caught up with Ed McLaughlin, husband, father of three, and the man whose job it is to keeps all of Virginia Commonwealth University’s balls in the air. 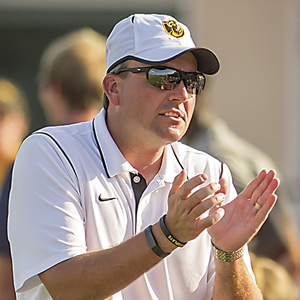 Keep reading to learn more about the man behind VCU’s sports programs – husband, father, athletic director, and sports lover Ed McLaughlin. Mountains or beach? Mountains, unless I can sit by the pool and look at the beach. I don’t like sand because it gets everywhere. Dogs or cats? Cats. We have two cats that follow me around the house incessantly. If you were stranded on a desert island, what food would you want to grow on trees? Fish n’ chips. I can pretend it contains nutritious content, but really it’s nothing but deep-fried goodness. Same island – what’s the one tech gadget you would want with you? My iPhone. I’m basically a living, walking Apple commercial. Favorite Richmond restaurant when family comes to town? The Boathouse at Rocketts Landing – best view of the Richmond skyline. Favorite Richmond restaurant for the whole family? Chuy’s in West Broad Village when we are home and Garnett’s Café in the Fan when we are around VCU. The servers know us well. What is your favorite vacation spot? Ireland, especially in County Kerry. I love the people, the culture, and the music. I have gone many times and never felt more at home in any other place on earth. Favorite family time? Family movie night at our house. We spend a lot of time together at VCU games and the kids’ games so we love the chance to be home together. What is your energy source? My family. Shelley and the kids motivate me to be better at everything – a better husband, father, and athletic director – every day of my life. Readers will be surprised to know: I love watching cooking and food shows. Call it a guilty pleasure, but I can watch Diners, Drive-Ins and Dives on Food Network for twenty-four hours straight if available.